Since they chose DEBRA UK as their charity of the year back in 2013, Excelian has raised more than £50,000 through a combination of their own fundraising activities as well as taking part in those organized by the charity. DEBRA is the national charity that supports individuals and families affected by Epidermolysis Bullosa (EB) – a painful genetic skin blistering condition which, in a worst-case scenario, can be fatal. At least 5,000 people are living with this devastating condition in the UK, and 500,000 worldwide. DEBRA focuses its work in two areas: the charity provides care and support to individuals and families living with EB and funds pioneering research to find effective treatments and, ultimately, a cure for EB. Adrian Marshall, the founder of Excelian, is also a long-term supporter. He has become a spokesperson for DEBRA, presenting at various meetings and events to help the organization gain further support. We talked to Adrian about his involvement with DEBRA and some of Excelian’s innovative fundraising activities. What prompted your original selection of DEBRA as your Charity of the Year? We were incredibly moved by the heart-breaking story of one of our employees who had tragically lost a child to Junctional EB. It was the first time we had run a ‘Charity of the Year’ initiative, but their story, combined with the passion and enthusiasm of the team from DEBRA that met us and presented to the staff, meant that the vote was almost a foregone conclusion, even up against bigger and better-known charities. What were your initial thoughts on the selection of DEBRA? I could immediately relate to DEBRA at a commercial level – as a small charity supporting a relatively unknown condition, it is hard for them to win corporate supporters – big organizations which have staff votes invariably end up supporting big well-known charities and causes. As an SME (Small to Medium-sized Enterprise) we understood the concept of ‘big corporate’ competition – we realized how important it was for someone like us to support a charity ‘underdog’! DEBRA also pushed all of my own philanthropic buttons – I could tell we could make a difference. They were open to all ideas and ready to engage with me and my team on every level. What were your key takeaways from the first year? Like all initiatives with partner companies, it takes time to engage and mobilize a workforce, creating a plan that can be easily rolled out and adopted. So, we began with some standard activities – collections, Give As You Earn, runs, walks and cycle rides. However, this wasn’t going to be enough to make the real difference. We needed to find innovative ways to channel funds from existing activities to DEBRA. Can you tell us about some of the ways you did this? We have a few, but one of the most efficient was replacing our traditional recognition awards with invitations to join DEBRA events such as boxing nights, sporting lunches, gala dinners, clay pigeon shooting and golf days. Alternatively, they could put up to £250 towards sponsorship for a DEBRA run, cycle or walking event – or simply give the money as a donation. Not all the initiatives are based on events though. For example, instead of buying artwork for the offices we ran staff photo competitions: the prints were commissioned, displayed and then acted as prizes at our Christmas raffle! The raffle formed part of a wider Christmas campaign including our ‘Client Christmas Appeal’ where, instead of buying our clients gifts and bottles of wine, we asked them to select a charity from a list that included DEBRA (highlighted as our Corporate Charity), to which we made a donation. Finally, during our office refurbishment in 2016, DEBRA collected our old desks, chairs and monitors, and sold them in their shops for more than £5,000! What have you found most rewarding from working with the charity? · being a part of DEBRA’s Events Committee team and meeting the fantastic people that are part of it. And what have you found most challenging? It’s the fact that there isn’t a cure yet. At each event you meet or hear about those who have to live with EB or who have lost their children to the disease. I’m still incredibly moved and inspired by every single story, but equally frustrated by the lack of an imminent cure. Finally, what are you looking forward to most moving forward? I’m looking forward to the day when DEBRA isn’t required, when EB is either easy to treat or it becomes altogether obsolete. Until then we at Excelian and our parent company Luxoft (who has also adopted DEBRA as their UK charity) are working to reach the £100K mark with our events and activities. I’m also looking forward to seeing the new Rare Diseases Center up and running later this year – this will make a massive difference for patients who will be able to see all the necessary specialists in one place. To find out more please visit www.DEBRA.org.uk. 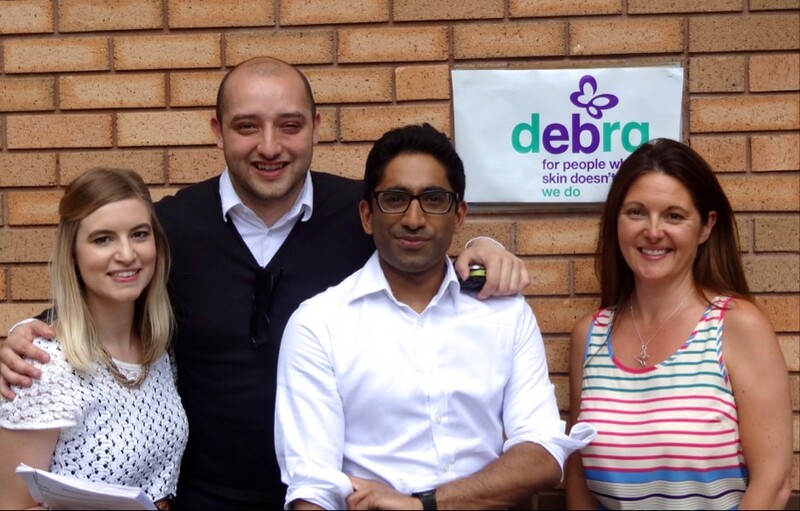 DEBRA is the national charity that supports individuals and families affected by Epidermolysis Bullosa (EB) – a painful genetic skin blistering condition which, in the worst cases, can be fatal. There are at least 5,000 people living with this devastating condition in the UK and 500,000 people worldwide. EB has a number of distinct forms: in the least severe form, blistering is confined to the hands and feet. In more severe cases, the whole body is affected and wounds heal very slowly, giving rise to scarring, physical deformity and significant disability. Blistering can also affect inner body linings, such as the mouth and throat and, in its most advanced form, EB is fatal in infancy. For more information please visit www.debra.org.uk or call 01344 771961.